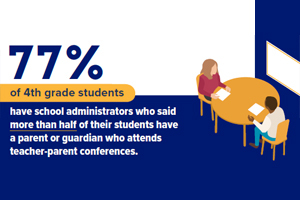 Our new graphics highlight estimated conference attendance by families of students in grades 4 and 8. Find out more about this and other contextual data from the National Assessment of Educational Progress using the NAEP Data Explorer. 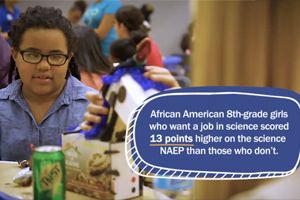 Watch Vice Chair Tonya Matthews describe how schools can use NAEP data to understand black girls’ achievement in STEM. 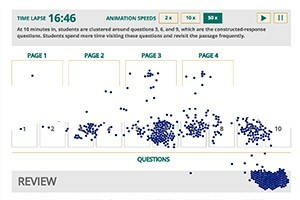 Watch a time-lapse visualization to see how 600 fourth graders spent their time as they worked through a 30-minute NAEP Reading question. READ three middle-school teachers' reactions and comments to actual responses by 8th grade students to open-ended questions on NAEP. 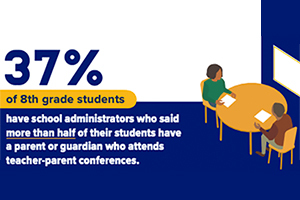 LEARN about ACTNext's new grant and partnership with the National Center for Education Statistics to develop features that could enhance student engagement and performance on NAEP. EXPLORE the U.S. Department of Education's Office of English Language Acquisition's new data story on English-language learners' performance on NAEP Reading and Math and graduation rates. Share the Governing Board e-newsletter and follow us on social media to stay engaged with the latest Governing Board and NAEP news.